The video below shows StreamHR Rapide in action, with the data collection recorded in real time. The Raman image shows single layer graphene in red and multi-layered graphene in green, on a Si/SiO2 substrate. The image is made up of 52,136 spectra collected at a rate of 700 spectra / s. A second image shows defects in the graphene. The surface of CVD (Chemical vapour deposition) graphene on copper is not always completely flat. This can cause problems with focus and data can be lost. Renishaw’s LiveTrack™ focus-tracking technology maintains sample focus, even over large areas that are not flat. You can image uneven, curved and rough surfaces automatically, just by focussing the sample and turning on LiveTrack. The image below covers a copper grain boundary, where the height of the grains varies by 3 µm. 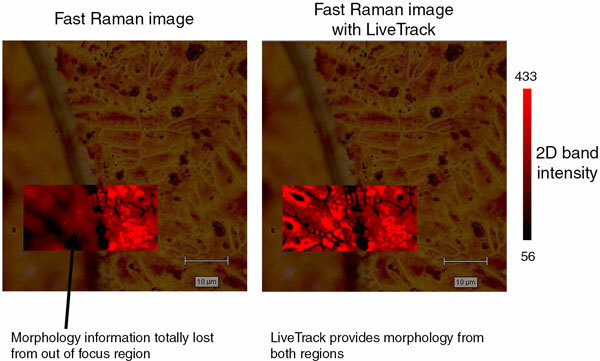 Using LiveTrack, morphology is provided from both regions with no loss of focus. The high spatial resolution of Raman microscope is ideal for studying the structure and defects of nanomaterials such as graphene and CNTs. 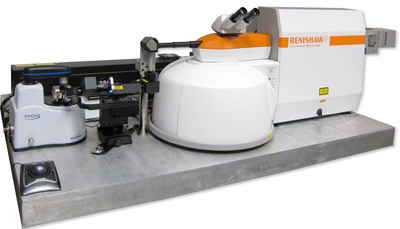 Raman can also be combined with scanning probe microscopy (eg AFM). This adds chemical analysis to the high spatial resolution topography and property information provided by SPM/AFM. Tip-enhanced Raman spectroscopy (TERS) can be used to acquire nanometre-scale Raman chemical information. Some thin carbon films (eg DLC) can be damaged by high laser power densities. Line-focus laser illumination keeps power densities to a minimum, while retaining total laser power. This enables you to collect high quality data rapidly, without damaging your samples. For more information about analysing carbon and 2D materials with Raman spectroscopy, please get in touch. We are available to answer all your questions and provide quotes for the Renishaw inVia.